The amazing and hilarious comic is making its debut as an all-new Dark Horse miniseries this spring! Comics fans and fancy news blogs aren't the only ones to take notice of Axe Cop; now the so-called “real” police know about him, too. And if there's one thing police don't like, it's a guy with an axe who's better than they are at catching and dispatching bad guys! Now Axe Cop and his partner Dinosaur Soldier are being treated like bad guys, not only by the police, but by the president and the army, too! But when a pair of nasty villains barge in from outer space and turn the army into actual bad guys, who gets the call to set things right? 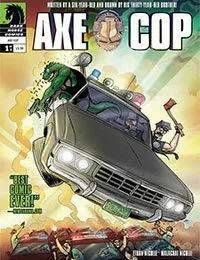 Axe Cop!